Which camping tent style is right for you? What is the best camping tent? That depends. You need to match your budget and needs to the right style and brand of tent to identify the best tent for you. 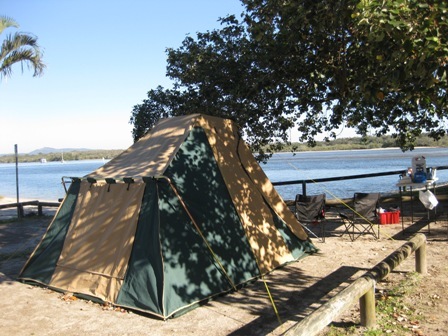 In assessing your camping tent needs, remember that you do not use a tent like you use a house. The tent is really only for sleeping in — the rest of your activities, such as cooking and eating will generally be done outside the tent, often under a tarp or shady tree, or in a screened shelter if the mosquitos are really bad. If you are new to camping, look for a tent that is advertised as being for approximately double the number of people you intend to sleep — that is, if you have a family of four, choose a tent recommended to sleep 8 people (6 to 10 people to allow for different manufacturer measurements) to allow additional room to store bags and move around in the tent, but not so huge as to take forever to set up. Make sure you look at how large your beds are too — you will need enough floor area to lay them all down, but also allow some gear for luggage and standing room. Usually there are several brands that sell each style of tent. I am not going to try to assess the merits of each brand in this post. The following is my opinion of the positive and negative features of the various tent styles available in Australia. Medium-sized domes are a good choice for first time campers who are yet to establish their camping needs. Decide on the floor area that you need (approximately double the number of people you intend to sleep), and then look for tents that are simple to set up with a minimum number of poles. Cabin tents are generally canvas and have a lot of internal room. For some reason they seem to come up on eBay second hand regularly — perhaps people buy them, use them once and decide they are too hard to set up, then sell them? If you are looking at a large cabin tent, why wouldn’t you just buy one mounted on a trailer? – a camper trailer. With the pack size of these tents, chances are you are going to be taking a trailer anyway. Tourer tents (also known as bus tents) are generally canvas and have a centre pole. Some of the extended tourers also have a upside down U-pole to support the rear of the tent. The best known (and very expensive) tourer tents are from Southern Cross. 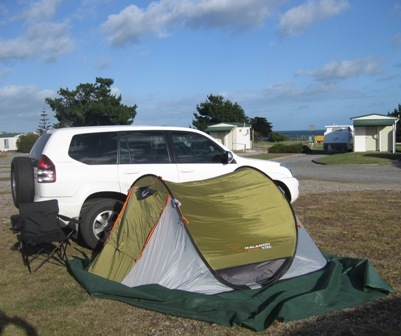 There are numerous cheaper versions on the market, including the OZtrail tourer tents. You will often notice this style of tent in the background of photos in camping magazines. I am using the term turbo tent to describe the increasing range of tents like the Black Wolf Turbo tents. Similar style new models on the market in Australia include the Jet Tent by Oztent and the OZtrail Blitz. 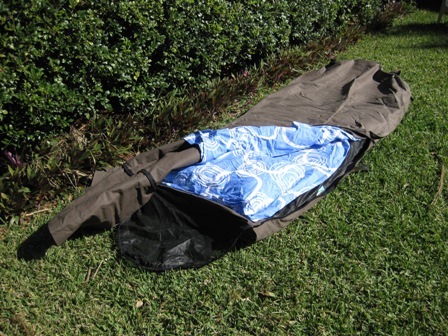 Tents in this category are available in polyester or canvas. 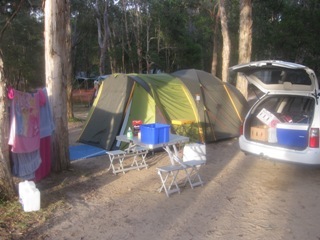 The Oztent system really does not have any other similar tents in the Australian marketplace. These are the pop-up style tent. Throw them in the air, they pop out, a couple of pegs and you are done. Malamoo 3-second X-tra tent -- yes, that is Bass Strait in the background! The quintessential Australian swag has made a comeback. Swags are very popular with single blokes going bush. Some swags resemble one and two person tents with pitching systems and insect screens. Others are more traditional, in that there is the possibility of a snake seeking some warmth joining you overnight. A large canvas tent mounted permanently on a trailer. Hiking tents are generally carried by people on multi-day hiking trips. Roof top tents, as the name suggests, mount semi-permanently to the roof of the vehicle. There are several different versions and brands on the market. This entry was posted in Tents & tarps and tagged Camping, Tent on 2 September 2010 by Rex.